We worship every Sunday morning at 9:30 AM. The service begins with a musical prelude and a moment for reflection. Worship then continues with hymns, prayers, Bible readings, a sermon, and communion. All are welcome to commune as we believe that all people are welcomed by God. Music is an important part of the worship service. The choir provides special music and leads the congregation in sung prayer. The music is a mixture of traditional hymns and contemporary songs. We sing in a variety of different styles and songs from different cultures. Children are an important part of King of Glory. Near the beginning of worship, children are invited to come forward for a children's message. Afterwards, they are invited to go to Sunday school, where they play games and learn a Bible lesson. They are also welcome to stay in the sanctuary if they prefer. Children are welcome in the congregation! After the worship service, which typically lasts about an hour, the congregation gathers outside to share in some coffee and conversation. 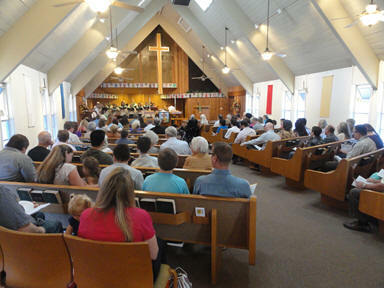 Many gather for an adult Bible study as well. All are welcome.